Yesterday I talked about my favorite sketchbook. Today I want to mention the kind of paper that I enjoy using most when doodling. Finding the paper was actually one of those lucky accidents. Was walking though a flea market and noticed a box of Southworth® 100% Cotton Business Paper for $5.00. Looked like a new box so I bought it. Drawing on this paper was fantastic. It feels different than anything else I had been using. It is heavy enough that it holds up well to erasing and accepts most mediums I throw at it. It is fairly absorbent so I don't use watercolor unless just as brush pens. There are a number of different 100% cotton papers available from different paper companies and I am slowly working my way through each kind. Some are toned slightly, there is a lighter 24lb weight paper that is just as nice but I like heavier weight papers, and there are a number of subtle textured surfaces available. This particular paper is called "Business Paper" but there are also many called "Resume Paper". The paper moderately expensive and fortunately, most are available in 100 sheet boxes. It is really not any more expensive than paper bought through art supply stores or online and you can load a thesis binder with a number of different varieties. You should give it a try. I think you will find these papers become some of your favorites. The Amazon link takes you to one of my favorites. I draw a lot. I usually draw in my sketchbooks at least once a day and more often than not, multiple times. There are different sketchbooks in each of my two pickups and in my wife's Magnum. There are sketchbooks in the family room. Most of my drawing materials and sketchbooks are in my studio. Several years ago I decided to scan all of my sketches so I had a digital library of everything. This turned out to be a bigger task than I had anticipated. I have about 10,000 scans at this moment. The job never ends because I keep adding to the pile of drawings needing to be scanned. Occasionally I get asked what is my favorite sketchbook. I have used pretty much every type of drawing paper and sketchbook made over the last 30 years. I do have one favorite sketchbook that I heartily recommend and will tell you about. It is called a Thesis Binder. Alone it doesn't contain any paper but is a hardbound black cover with a spring loaded spine. I have both 1" and 2" binders. 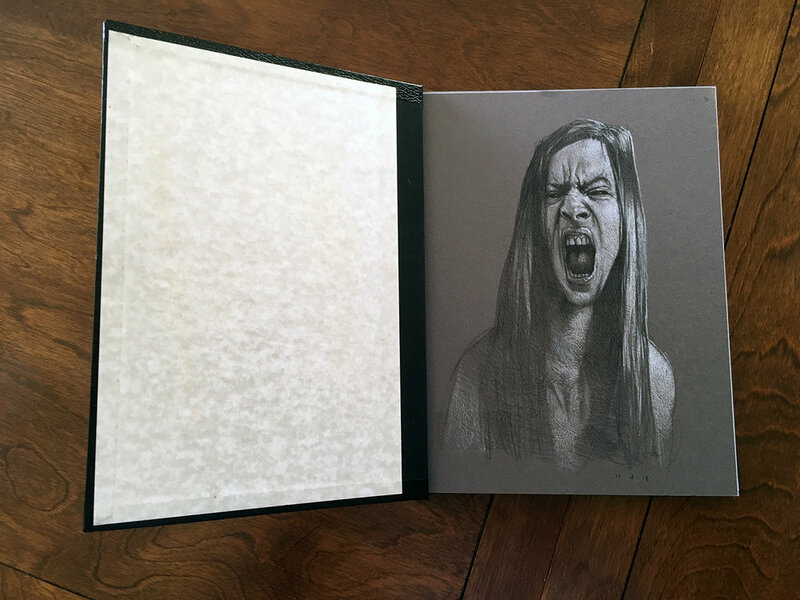 The beauty is that you can load them up with the paper of your choice, order the finished sketches to the back of the book or remove them, and it looks really cool. I usually remove all the completed sketches daily and put them in a document box for safe storage. Over the last few years I have started drawing drawing on paper that I buy in reams from various sources. You can get just about any type of paper imaginable and have a sketchbook filled with a wide variety to match your mood and medium. This is one of my Thesis binders loaded with a variety of colored card stock. I would recommend you give them a try. They are strong enough to keep your sketches protected and flexible enough to load with a wide variety of paper. The binders are readily available on Amazon. The link is listed below.